BRUSSELS - A NATO spokeswoman says the military alliance is "very close" to terminating the 7-month long bombing campaign in Libya. Spokeswoman Carmen Romero warned, however, that it is still too early to set the exact date because of the continuing threat to civilians from pro-Qaddafi fighters. NATO warplanes have flown more than 9,500 strike sorties since the air attacks began on March 19. With armed opposition to the new Libyan authorities now limited to only a few more towns, the alliance has scaled back on the airstrikes, conducting an average of 15 a day in comparison to about 70-80 a day at the height of the campaign this summer. Romero said on Tuesday the decision on ending the operation will be taken after NATO conducts a comprehensive political and military analysis of the security situation. Also Tuesday, Libyan fighters celebrated the fall of the stubborn former regime stronghold of Bani Walid by firing weapons in the air and hanging revolutionary flags on buildings, while in another part of the country, their comrades launched a major assault on Muammar Qaddafi's hometown of Sirte. In the capital Tripoli, U.S. Secretary of State Hillary Clinton announced increased support for Libya's new leaders, pledging millions of dollars in aid including medical care for wounded fighters and additional assistance to secure weaponry that many fear could fall into the hands of terrorists. The push from the east of Sirte to rout remaining resistance came a day after commanders announced they had captured most of a second stronghold, Bani Walid, 90 miles southeast of Tripoli, . While welcoming successes in Bani Walid, Libya's new leaders have said they would only declare liberation after the fall of Sirte. The capture of the coastal city 250 miles southeast of the capital would have symbolic value as well as give them control of the country's ports and harbors. Military commander Ali Abdel-Rahman in Bani Walid said that revolutionary forces were supplied with new weapons on Saturday which allowed them to surge into the small city the next day. "We didn't find a regular army but only loyalists to Qaddafi, snipers with automatic weapons," he said. "There was no resistance but we lost three martyrs on the first day." Libyan fighters have squeezed the die-hard Qaddafi supporters into an area comprising just a few blocks but have been unable to gain full control of the city. It has been more than two months since the former rebels gained control of the capital and much of the rest of the oil-rich North African nation. Persistent fighting has prevented Libya's new leaders from declaring final victory and setting a timeline for elections. Fighters who have been besieging Bani Walid for weeks have finally gained control of the city center, which was deserted on Tuesday. Buildings were pockmarked from bullets and rocket fire. The only doctors in the main hospital were foreigners. 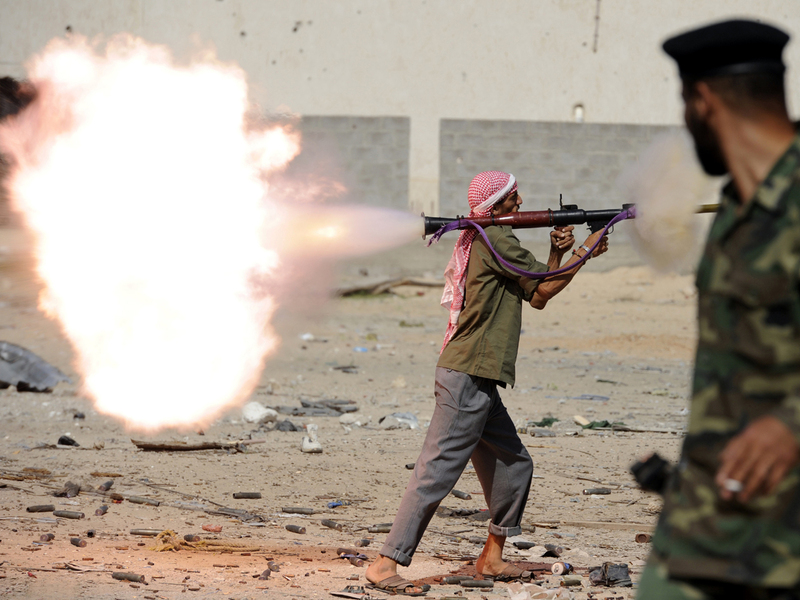 "We didn't find a regular army but only loyalists of Qaddafi, snipers with automatic weapons," he said. "Some of the Qaddafi brigades took off their uniforms and vanished." He said even families had fled the area. "There was a widespread perception that there would be a massacre here and pools of blood, but on the contrary, it was very bloodless, swift and with no resistance." That has been the pattern throughout the eight-month conflict that began as an uprising against Qaddafi's repressive rule of nearly 42 years. His opponents have frequently faced fierce resistance from within cities only to find the areas largely abandoned after they enter, raising the prospect that Qaddafi's supporters could flee and wage an insurgency. NATO said it hit a command center comprising nine vehicles near Bani Walid on Monday. "The fighters who liberated Bani Walid are not the ones who looted the houses, but the fighters who came later on to comb the area. They stole and looted from houses," he said. In an unannounced visit to Libya on Tuesday, Clinton brought pledges of new U.S. aid totaling $11 million. That will boost Washington's contribution to Libya since the uprising against Qaddafi began in February to roughly $135 million. U.S. officials told reporters traveling with Clinton that the money was evidence of the administration's commitment to working with the Transitional National Council as it consolidates control over the entire country and moves to hold free and fair elections. As part of the new aid package, the U.S. will relaunch several educational programs, including Fulbright scholarships and English language training, and help fund an archaeological project that will survey eastern Libya, the officials said. They said Clinton will also be stressing the importance of good governance, political inclusiveness, democratization, and the diversification of Libya's economy so it no longer is almost entirely dependent on oil revenue.